In coordination with the 50th anniversary of the release of “Sgt. Pepper’s Lonely Hearts Club Band,” Apple, Capitol and Universal Music Group are giving fans multiple options to experience the Beatles landmark album. Prior to jumping into this review, I must disclose that I served as a consultant on the project, contributing images and ideas. I am given a credit in both the book and the gatefold cover holding the discs in the deluxe edition. However, my contributions to the project have in no way influenced my enthusiasm for these releases. My enthusiasm is based entirely on the great music recorded by The Beatles back in 1967 and the wonderful production and engineering by Giles Martin and Sam Okell on the stereo remix, 5.1 mix and outtakes. Having listening to these recordings in the deluxe edition and the vinyl for nearly two weeks, I am now ready to share my thoughts. But to truly appreciate and understand the creative process behind the album, one must buy the deluxe edition box set, which contains four CDs, a Blu-ray disc and a DVD, beautifully packaged in an outer case with a 3-D imaging of the cover and a replica of an EMI tape box along with a hardcover book, the “Sgt. Pepper” cut-out sheet and two posters. And while some may find things they would have done differently, a release should be reviewed for what it is and not get sidetracked by making a big deal out of minor matters. The deluxe edition of “Sgt. Pepper’s Lonely Hearts Club Band” is a solid A in every way, from the packaging to audio recordings and videos. The deluxe edition starts out with the stereo remix on CD One. This is the same as the stereo remix available on its own. The real treasure of the deluxe edition is the two CDs of session outtakes. The songs are presented in chronological order based on when recording began for a particular song. This provides the listener with a feeling of how the “Sgt. Pepper” sessions progressed. CD Two opens with several takes of the first song recorded during the sessions, “Strawberry Fields Forever.” The song’s evolution is traced from start to finish, beginning with Take 1, recorded on November 24, 1966. This simple recording is an exquisite blend of mellotron, guitar, slide guitar and creative drumming, topped with John’s double-tracked lead vocals and harmony vocals by John, Paul and George (which were inexplicably mixed out of the version of Take 1 appearing on “Anthology”). Although Take 1 was a truly remarkable performance, John was not satisfied. The group returned to the song on November 28, with a new arrangement. The Sessions disc contains Takes 4 and 7, the latter of which had its opening two verses sped up edited into the finished master of the song. Next up the fast and heavy third version of the song, represented by Take 26, which was slowed down and edited into the final master (missing only its instrumental opening). Finally, the sequence ends with the 2015 stereo remix by Giles Martin. “When I’m Sixty-Four is represented by Take 2, which consists of Paul’s guide vocal and Ringo’s drums with brushes, with overdubs of Paul’s piano and John’s guitar. We get to hear Paul’s vocal prior to it being re-recorded and sped up for the finished master. The “Penny Lane” sequence begins with the instrumental Take 6, which formed the basis on the finished master. This is followed by part of the vocal overdub session, followed by Giles Martin’s 2017 stereo remix. The “A Day In The Life” session tracks are fascinating. At long last we get to hear John’s beautiful pure vocal on Take 1. This take, along with the also included Take 2, features of John on acoustic guitar and Paul on piano. George and Ringo provide percussion. Because the group was not sure what to put after the line “I’d love to turn you on,” we hear Mal Evans counting off 24 measures each time, with increasing amounts of reverb added to his voice as the numbers get higher. Paul has yet to add his vocal to the middle section, so we get to hear his jazz-influenced piano much clearer than on the finished master. These remarkable takes are followed by the orchestral overdub session. Next up are the “choral” takes during which the group recorded themselves humming an “E” note. This was under consideration for the end of the song following the second orchestral build-up. The takes show the difficulties in holding the note and doing so without laughing. An interesting idea that did not pan out. (The final hum ending was edited to the end of Take 2 to give an idea of how it would have sounded at the end.) Finally we have the complete final chord sessions during which multiple keyboards were used to simultaneously hit and hold an “E” chord. All nine takes are included. The final Take 9 was edited to the end of the master. The album’s title track is represented by two takes, numbers 1 and 9. Take 1 is the group’s first instrumental only attempt at the song. Take 9 has vocals, but is missing Paul’s stinging lead guitar, the French horns and crowd sound effects. The take does not have a structured ending and the group continues playing while Paul sings “I feel it, I feel it, gotta get free now,” perhaps acknowledging that he is now free of the mop-top Beatles and is truly part of Sgt. Pepper’s Lonely Hearts Club Band. There are also two takes of “Good Morning, Good Morning.” Take 1 is an instrumental, while Take 8 has vocals. These takes show the herd-driving nature of the track before it was embellished by horns and animal sound effects. CD Three opens with two takes of “Fixing A Hole” from the session held at Regent Studios, Takes 1 and 3. These early versions have Paul on harpsichord, Ringo on drums and probably John on bass (although it could be George, who would overdub his guitar solo at Abbey Road). “Being For The Benefit Of Mr. Kite!” is represented by studio banter before Take 1 and after Take 4, along with Takes 4 and 7. John provides a guide vocal backed by George Martin on harmonium, Paul on bass and Ringo on drums. Even without its atmospheric embellishments, the song is entertaining. Take 9 of “Lovely Rita” has Paul’s guide vocal backed by his piano, John and George on acoustic guitars and Ringo on drums. John can be heard talking before the song and during the song’s instrumental introduction. “Lucy In The Sky With Diamonds” is represented by Takes 1 and 5. Take 1 is preceded by Paul vamping on organ and studio banter. John provides a guide vocal and is backed by Paul on Lowery organ, George Harrison on acoustic guitar, Ringo on drums and George Martin on piano. John does not sign during the chorus in order to concentrate on his shaking of maracas. Paul provides organ ad-libs at the end. Take 5, which is preceded by talk and a false start, has the same lineup as the first take. The take that was used for the finished master is a later take that does not have Martin on piano. “Getting Better” is represented by Takes 1 and 12. The first take, preceded by an instrumental warm-up by the band and studio banter, is an instrumental with Paul on bass, John on electric guitar, Ringo on drums and George Martin on pianette (an early type of amplified piano). Take 12, which formed the backing track for the finished master, is also an instrumental. It has the same lineup as the first take, but is adorned with additional bass and drums, piano and Harrison on tamboura. George returned to Indian instruments on “Within You Without You.” The disc contains the unedited Take 1, which features the Indian instruments prior to the string, acoustic guitar and vocal overdubs. It is a remarkable recording, with the dilruba string instrument providing the melody line of George’s vocal. (“Anthology” contains an instrumental version of the song edited and with the string overdubs.) This is followed by a rehearsal session with George instructing the musicians on what to play. The disc contains two instrumental backings of “She’s Leaving Home,” Takes 1 and 6. The first take would be selected for the master. There is little difference between the two takes. George Martin would fade out some of the instrumental passages on the final mix, most noticeably a five-note cello line following the violins at the end of each chorus. Take 2 of “With A Little Help From My Friends” is preceded by the false start of Take 1. It is a delightful instrumental run-through of the song with Paul on piano, George Harrison on guitar, Ringo on drums, John on cow bell and George Martin on Hammond organ. The third CD concludes with the last song recorded for the album, the reprise of the title track. Take 8 is preceded by studio banter of Paul instructing Ringo to hit the bass drum loud. The line-up is most likely Paul on lead vocal and guitar, George on guitar, John on Hammond organ and Ringo on drums. The group is close to the sound Paul was looking for. The next take would form the finished master. Next up is another fascinating version of “A Day In The Life,” the first mono mix made on January 30. At this stage of the recording, Paul had overdubbed his bass and added his vocal on the middle section of the song, although he flubs the lyrics towards the end and lets out an expletive. Both would later be re-recorded, along with Ringo’s drums. For those wanting to hear how “A Day In The Life” evolved, this track falls after Takes 1 and 2 and before the orchestral session, hum and piano chord ending takes, all of which are on the second disc. This is followed by early mono mixes of “Lucy In The Sky With Diamonds” and “She’s Leaving Home.” The latter early mix contains the extra cello notes heard on the instrumental takes of the song on disc 3. The final track on the disc is the mono mix found on the Capitol promotional single, which ends with a seven-note piccolo trumpet flourish. The track appears to have been dubbed off a vinyl single as its sound quality is inferior to the other tracks on the disc. That is not all bad as it brings back memories of how the song sounded on radios in America back in 1967. The Blu-ray disc contains both video and audio content. The video section contains the documentary “The Making of Sgt. Pepper,” which was done for the album’s 25th anniversary. George Martin, sitting behind a mixing board, plays parts of the songs, often isolating on one or more of the four tracks on the album’s master tape. The film also contains comments from Paul, George and Ringo. It is well worth watching as it helps explains how the album was recorded. Also included are the 1967 promotional videos for “A Day In The Life,” “Strawberry Fields Forever” and “Penny Lane. Although these are on the “1+” video release, it is nice to have them included in the package. 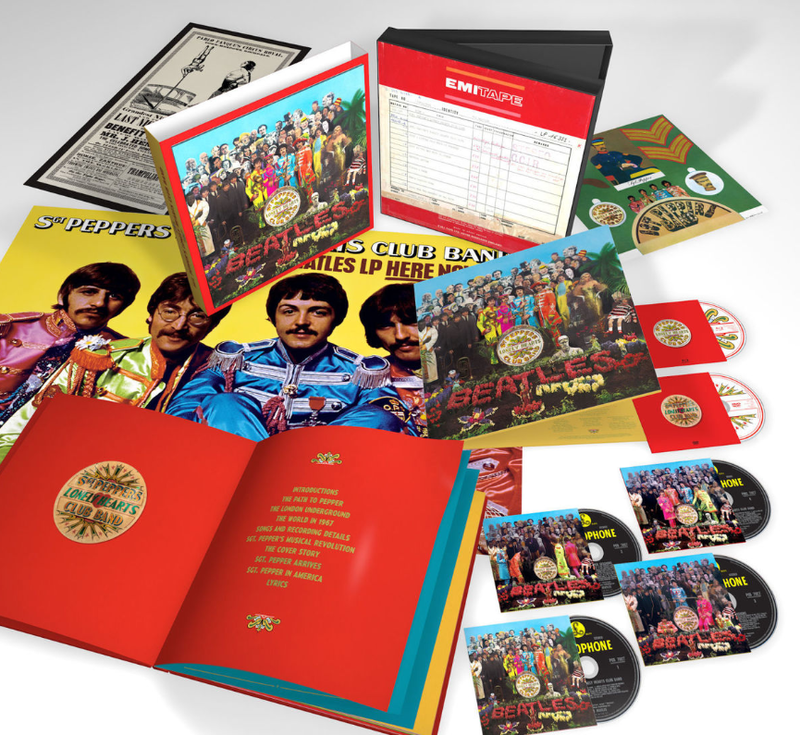 The audio content contains the album plus “Strawberry Fields Forever” and “Penny Lane.” There are three format options: PCM Stereo (of the remix); and two 5.1 playback modes, DTS-HD Master and Dolby True HD. These 5.1 mixes are identical. The Dolby mix is included because some audio/video systems cannot play the DTS-HD format, which is considered by many to be superior. The 5.1 mix sounds great; however, those who were hoping for hearing sounds not present in the stereo remix will be disappointed. It, like the stereo remix, is based on the original 1967 mono mix. If your home system has a Blu-ray player and you want to hear the stereo remix, you should play this disc in the PCM Stereo mode as the sound quality of Blu-ray is significantly superior to that of a CD. Leave the stereo remix CD for your car. The Blu-ray disc does not contain the original mono or stereo mixes from 1967. Inclusion of these mixes would have allowed listeners to hear these mixes in the superior Blu-ray audio format. The mono mix is included on the fourth CD. For those wanting to hear the original 1967 stereo mix, the 2009 remaster of Sgt. Pepper shall remain in the core catalog. And, of course, collectors can pull out their vinyl discs pressed from 1967 and beyond. The DVD repeats the video content from the Blu-ray disc. It is included in the box set for those yet to upgrade from a DVD to Blu-ray player. And if you haven’t done so, this release provides the perfect excuse to do so, particularly keeping in mind that a Blu-ray player will also play your CDs and DVDs. Blu-ray players can now be found on sale for under a hundred bucks. For those looking for a high-end player, the Oppo UPD-203 Ultra HD Blu-ray player is the way to go. The deluxe edition of “Sgt. Pepper” is absolutely essential for anyone wanting to understand and enjoy the magic captured on tape by The Beatles, George Martin and the Abbey Road engineers. As I stated in my book, The Beatles and Sgt. Pepper: A Fans’ Perspective, Sgt. Pepper “was then and still remains a great listening experience.” Beatles fans rejoice and pray that this is the first in a series of deluxe editions to come. A long time coming –but sounds like its worth it! In 1967, as a young Beatle fan (with no internet, of course) I had assumed that Strawberry Fields and Penny Lane were to be upon the Album and was quite shocked when they weren’t… On to College and education on British Albums and German pressings (supposedly the best sound) and all the various ‘other versions’. Helping my friend with his Beatle show on our college radio station and then – bootlegs! (1971). Not many Pepper things escaped back then — but later –WOW. Then the Japanese Box ( having bought Pepper 4 times over by then…) – then the Barrett releases, Yellow Dog, Pear (more owning of Pepper!! ), finally, waiting at Rene’s All Ears on Melrose in LA for the release of the CD!!!! On to the 2009 remaster – Anthology tracks – into the oughts with an amazing 8 CD’s of Pepper outakes!!! (it will be fun A-B-ing the outs to the official ‘outs’!!) and now the 50th Deluxe Release!! I can’t wait…!!! Thanks Bruce for you great books and all the years of insight and fellow-fandom! Bruce has published another excellent book about The Beatles. In fact, this is will be an outstanding companion to have, with the new Sgt. Pepper’s Lonely Hearts Club Band Deluxe Box Set. Lastly, I hope Bruce will do the same for The White Album and Abbey Road, which are excellent albums to celebrate 50th. Anniversaries as well. Please keep these in mind since no one could to them justice like you. Thanks for the joy you bring to all true Beatles fans, like me. Just got my book in the mail today. I will be purchasing the deluxe box in 2 days. This is a wonderful time tone a Beatle fan! I was 12 years old when “Sgt. Pepper” was issued in 1967. Because I was still in elementary school then, my parents, sister, and other relatives bought my Beatles albums for me as gifts. Although it’s not my favorite Beatles album – that honor goes to “Abbey Road” and the British version of “Revolver” – “Sgt. Pepper” was, and still is, an amazing musical achievement. Until I expanded my Beatles collection in the late ’70s and early ’80s, I only owned the Capitol mono version of “Pepper.” I did have the four stereo mixes on the 1967-1970 hits package, as well as the ultra-slow stereo mix of “She’s Leaving Home” on 1977’s “Love Songs.” Eventually, I purchased the Parlophone stereo version (I never owned the Capitol stereo album) and enjoyed that one too. These days, I listen to the 2009 remastered CDs. I’m looking forward to the new box set, which I should receive from Amazon in the next week or so. Your Sgt. Pepper book is terrific, as are all your other books. I was especially impressed with the e-book; so much so that I ordered the Vee-Jay and Capitol e-books as well. They are fantastic, and make a nice companion to the hardcover editions, which I have owned for years. My only regret is that Apple/UMe did not select you to do the liner notes for THE U.S. ALBUMS box set. 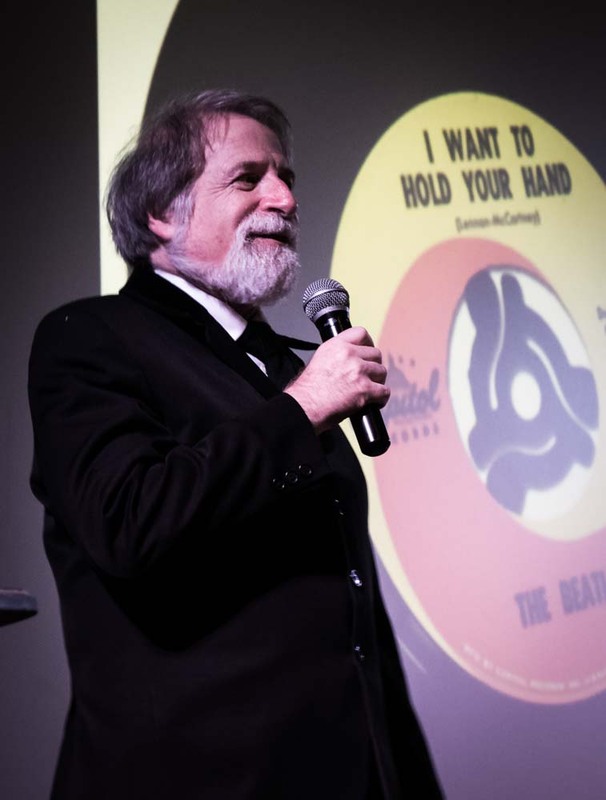 Not to knock Bill Flanagan, but after all the hard work you have done on chronicling and reviving interest in The Beatles’ U.S. catalog, that honor should have been ours. I’m looking forward to your next project. Please don’t retire yet! I meant to say the honor (of writing THE U.S. ALBUMS liner notes) should have been YOURS. Bruce Spizer GETS BACK to Writing Next Beatles Book!